Been wanting to make salted eggs since I started the blog, but I just couldn't find fresh duck eggs anywhere. Duck eggs are a lot better to use in making salted eggs because of their tough shells which give them a longer shelf life. They also have larger yolk to white ratio compared to chicken eggs. As you know, it's the yolk that matters most in salted eggs so the large duck egg yolks would be better...but I'm not sure if I will ever find duck eggs here, so I decided to just use chicken eggs. As expected, the yolk of my salted chicken egg didn't turn out as creamy, granular, and oily compared to that of store bought salted duck eggs...but I tell yah, my daughters who weren't so fond of eating salted eggs, love it! Why? Because they weren't too salty. That's actually the best thing about making your own salted eggs at home. You can always control how salty you want them to be by doing a taste test starting at the 21st day after soaking them in brine. 2. Store the jar in room temperature for 21-25 days. Do a readiness test on the 21st day by boiling one egg. If you think it is salty enough for you, and the yolk is already dark yellow, then wash eggs then boil for 20 minutes or until fully cooked. 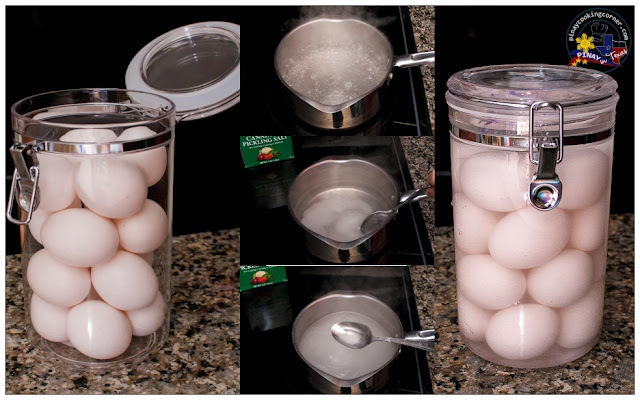 Run the eggs under cold water then drain. 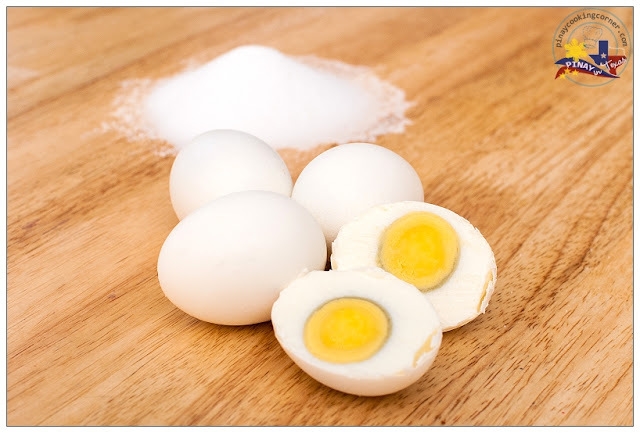 If you think the eggs are not yet ready, leave them in the brine for 4 to 6 more days. 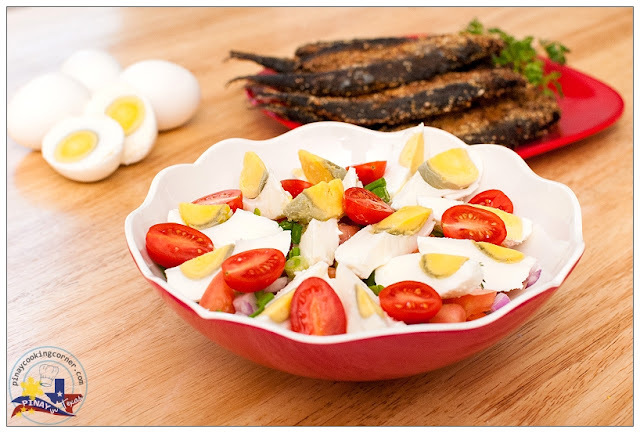 Hardboiled salted duck eggs can be used in recipes like this Shrimp and Salted Eggs Pasta, or serve with Sinaing na Tilapia or with fried fish or meat. 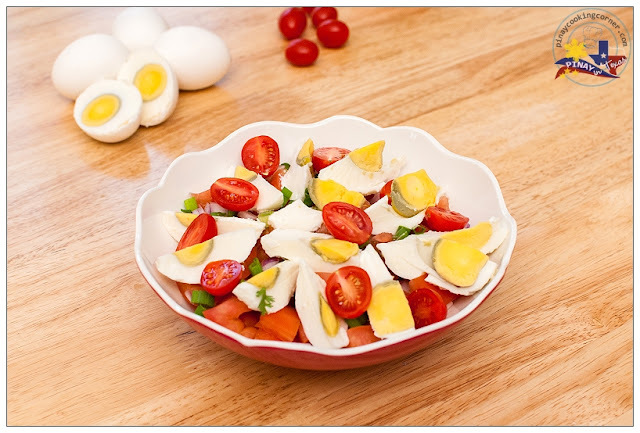 You can store boiled salted eggs in the refrigerator for up to one month. Oh I love these! We have been getting some free range eggs recently that have the biggest yolks I've ever seen, so I bet they would be perfect for this. I need to place an order for another dozen. Thanks for sharing this great recipe! BTW -I noticed you hardboiled them. Can you softboil them or it there a problem with the uncooked yolk after brining for so many days? We're just used to eating salted eggs harboiled, MJ...but you can softboil them! Wow.. looks really great.. Mouthwatering I should say... Heavenly clicks too !! I have seen this recipe in one daring bakers challenge, never tried though. Looks delicious. Hope you are feeling better now. Thanks Swathi! I haven't fully recovered but I'm feeling a lot better now. What a discovery. I am comfortable with store bought salted eggs all this while. And its an issue finding duck's eggs over here but using chicken eggs never ever struck my mind. Okkkkk!!!!! Am gonna try because I just simply adore salted eggs, does not matter whether the duck or chicken version. Brilliant recipe and a perfect fit for me. WOW,LOOOOVE THIS ; D . . . we've got lots of duck eggs nowadays, they always end up as leche flan ;-D will now try making salted eggs . . . tnx ms tina! I've been living in Vienna for over 35 years now and have always wanted to make salted eggs from duck eggs. Today I went to a new Vietnamese grocery store and found duck eggs selling for 50 cents a piece (got 10 for 5 Euros). And this is how I found your blog. Will try your method and let you know later how I par with the experiment. Greetings from Vienna! Welcome to PiTCC, Virgilio! Do let me know how your salted eggs turn out. Hope you'll try other recipes here too! Hi Tina, in the absence of canning salt, what other kind of salt can we use and do we keep the same measurement ? I've tried using kosher salt before, and I used the same measurement. Ooops... looks delicious. i really want to make and try your recipe. i will let u know if i'm successful. Nice for sharing. We tried with chicken eggs and we were lucky to get them with double yolks. I find them as delicious as duck eggs. It is only today that I found the time to make the salted eggs. What I forgot to ask you is the amount of salt to the 10 duck eggs I have. Your procedure was meant for chicken eggs which are smaller than duck eggs. Would it make any difference (I bet!)? Thank you. What matters is the water-salt ratio, Virgilio. If you used 5:1 ratio, I'm sure it will be ok.
Did you try the recipe yet with the Shao Hsing cooking wine? If so, could you post the recipe. Thanks. Goodmorning.i have tried your method of making salted egg today.i am very fan in eating salted eggs. If it will be succesful i am planning on selling some to my relatives,eventhough it is a long waite method still rest assured of the quality. Hello Tina, saw your recipe and desided to give it a try. We have our own ducks and chickens so figured why not. We have a few asian friends will let them try, to see what they think. I honestly haven't tried reusing the brine. But I think it's possible. The only drawback is that you can't be sure if the second batch of eggs will turn as salty because part of the salt has already been absorbed by the first batch.